Join James Blonde and the hilarious cast including Dr Ernie Blow, Kurt Blingburger, Norman Flowers and Felicity Goodtime as they take you on a good old British Romp of slap stick humour, songs and more. 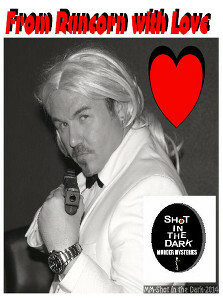 Become one of Blonde’s Agent’s as we hunt for Spy’s, Atomic Weapons and of course Murderers!! Will Your Mission be successful and how will you fare being a Secret Agent for the night? Click here for the Shot in the Dark page.